There are people that like to build cars and trucks, and before even driving them want to brag about it on social media. They want attention and fame, as well as the media exposure. Then there are people like Loren Sharrard who simply like to go fast, and do it daily. Loren doesn’t even have a Facebook account and I am not sure he even owns a computer. 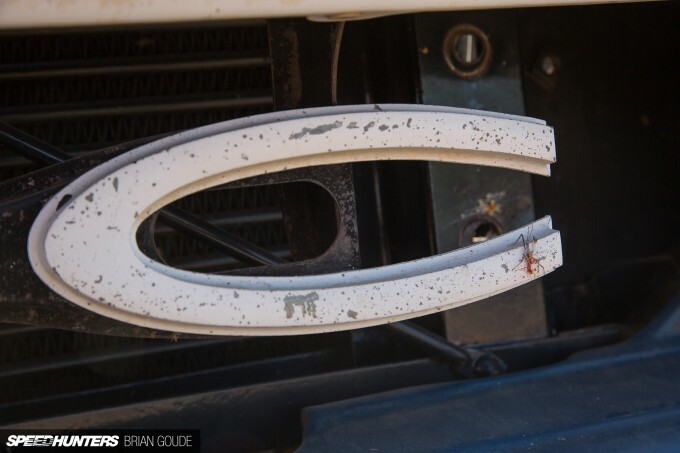 Tracking down this Arizona local to shoot his truck was an adventure in itself. 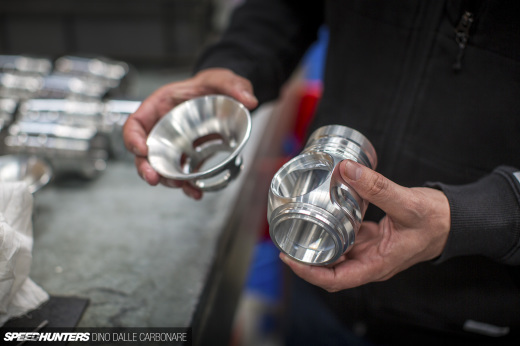 Loren’s custom automotive life started as a 16-year-old die-hard drag racer from Michigan; his need for speed taking him all over the States to more tracks than he can remember. 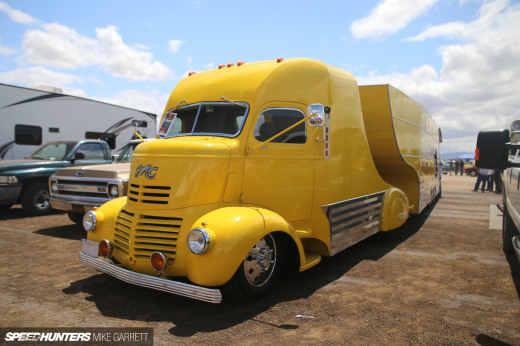 He eventually joined the NMCA (National Muscle Car Association) and started racing in the Streetcar Shoot Out series, which was essentially no-rules drag racing, except that the vehicles had to be road registered and insured. 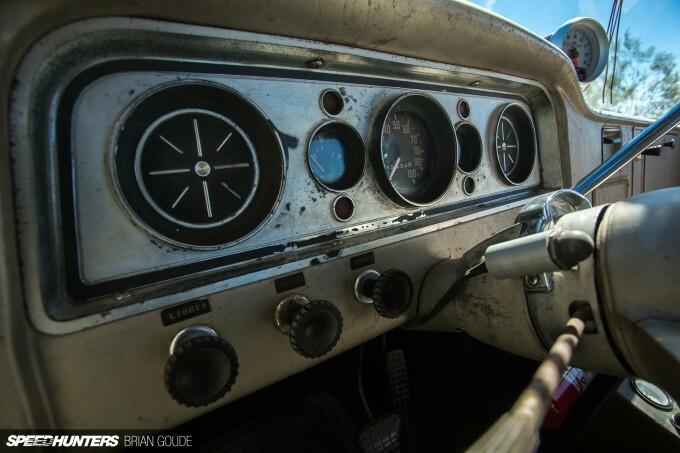 Competitors would take their cars on a 5-mile street cruise and then go back to the track and race for hours on end to find out who was the fastest. Loren now lives in the desert town of Apache Junction where you can pretty much do whatever you please. Apache Junction lies just on the outskirts of another desert town known as Phoenix, Arizona. Living in a state where you can carry a gun yet not shoot off fireworks seems to be about the same as owning a truck with twin turbos yet only being able to go 75mph on the highway. 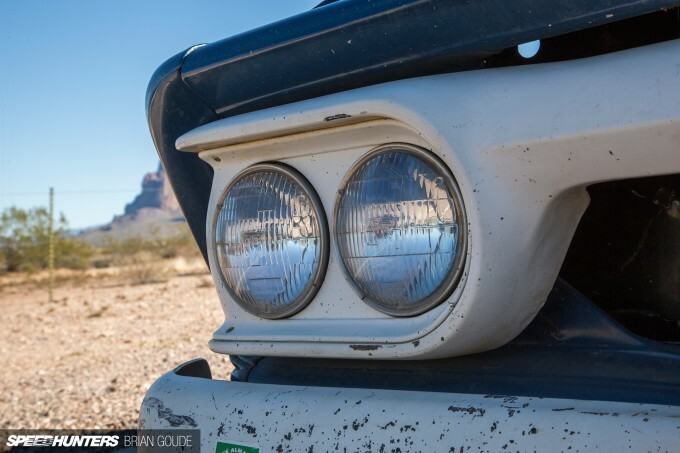 The roads out in Apache Junction are best attacked with either an off-road vehicle or something that can handle the curvy mountain sprints, which is amusing as Loren’s truck really begs to just go straight at an obnoxiously fast pace. 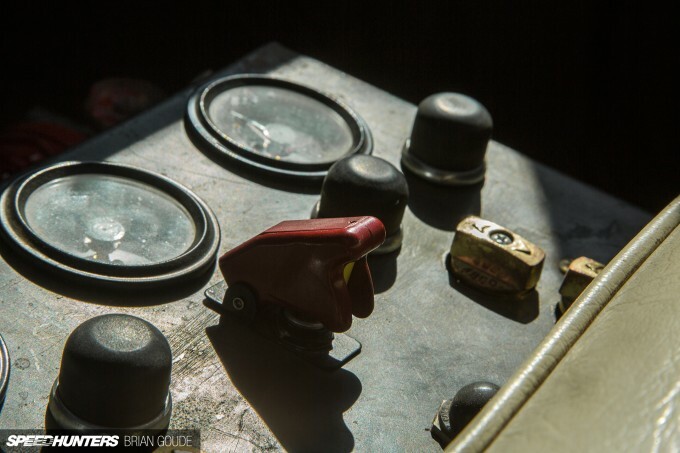 But his garage is also home to many custom bikes and a few projects he has yet to finish. 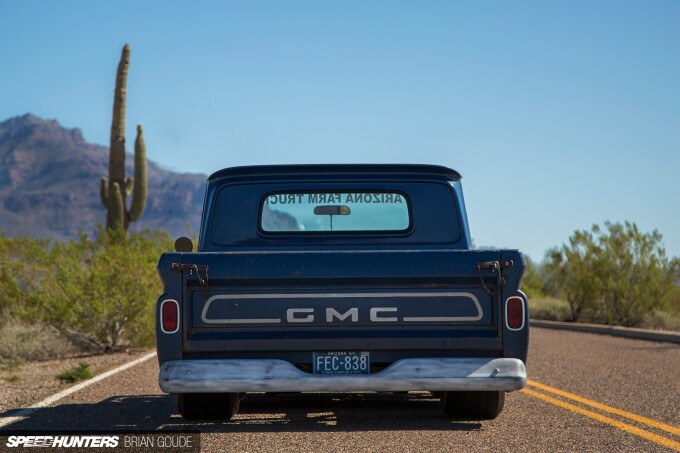 This 1964 GMC C10 originally came from Northern California; Loren’s buddy Jim Warner purchasing it off Craigslist for a mere $600. Of course, for that price there was a small catch – it was in a few hundred pieces. In fact, the only things intact were the frame rails with a few components attached. The motor and transmission were out and the cab and bed were sitting next to boxes of parts. 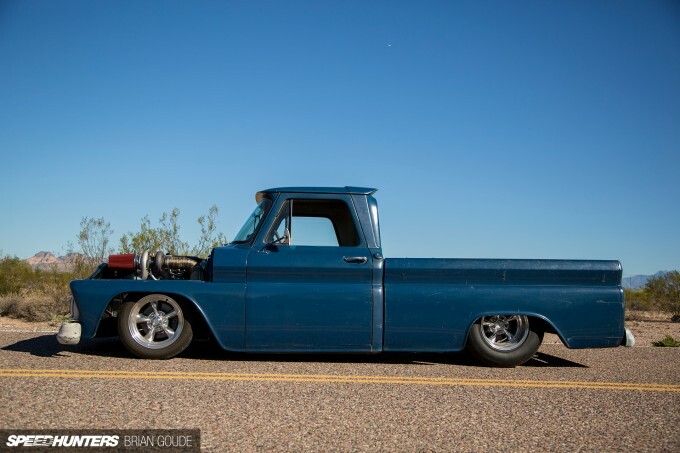 After about 8 months, Loren convinced Jim to sell the pile of parts to him, and once the deconstructed truck was delivered to his garage it took him no time to get started on the rebuild. A year and a half later Loren and his son Brian had managed to create what you see here. 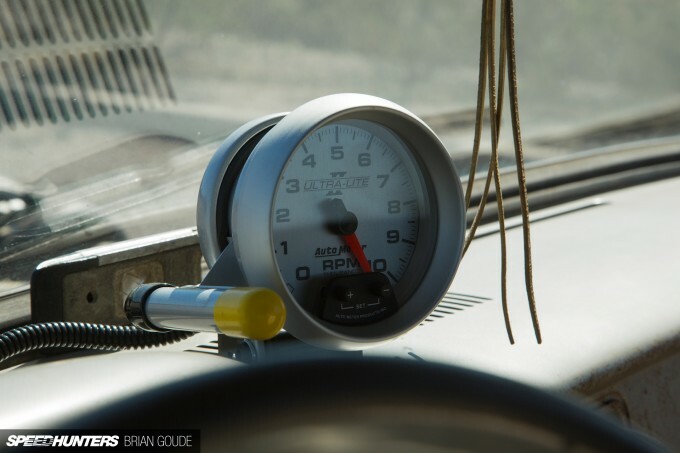 This insanely fast but relatively stock truck screams down the road with ease. 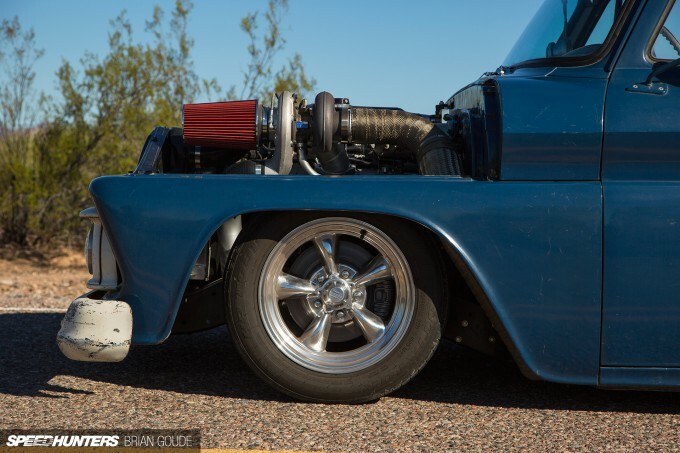 The powerplant is based around a built 6.2-liter Chevy LS3 V8 with a big turbo-spec cam. 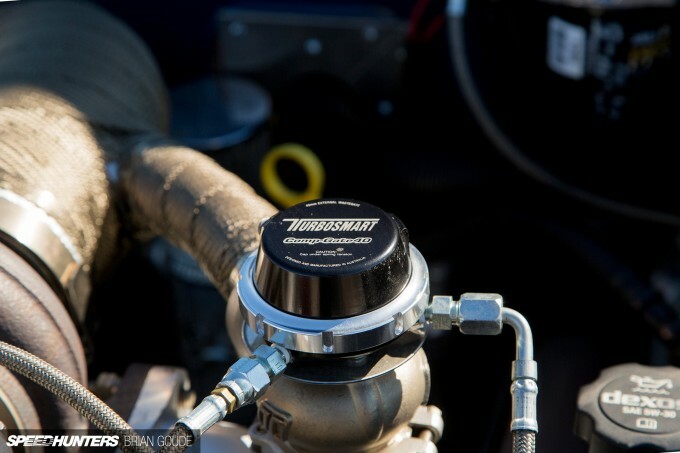 The motor is force-fed air into a 92mm Nick Williams throttle body by a pair of monster BorgWarner 63mm turbochargers sitting on custom exhaust manifolds. When Loren first put the tires on a dyno it registered well above 1,200hp on 15psi of boost, as controlled by a pair of Turbosmart CompGate40s; but it was just too wild for his daily driving needs. 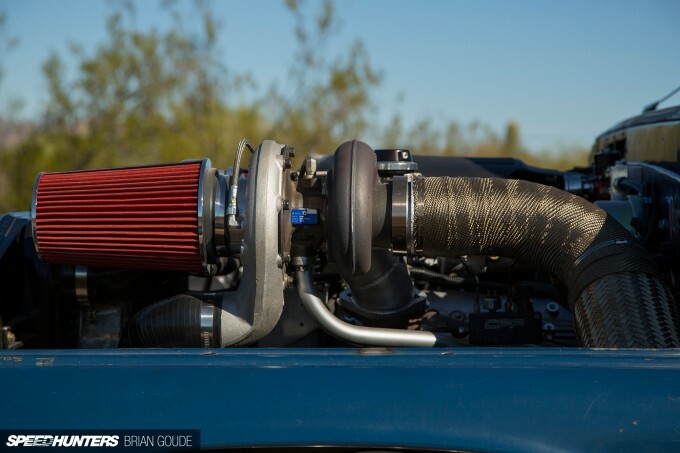 The car has been de-tuned a few times since and it now sits at a more street-friendly 650hp on 5psi. It’s still more than enough power for a lot of fun. 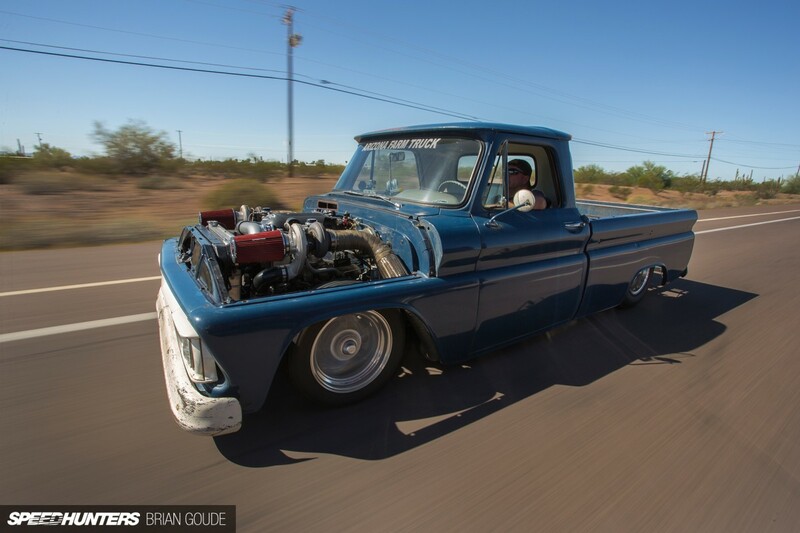 The hood does fit on the truck to make it somewhat of a sleeper, but Loren leaves it off most of the time. And honestly, who’d want to run a hood when you have an engine that looks like this?! 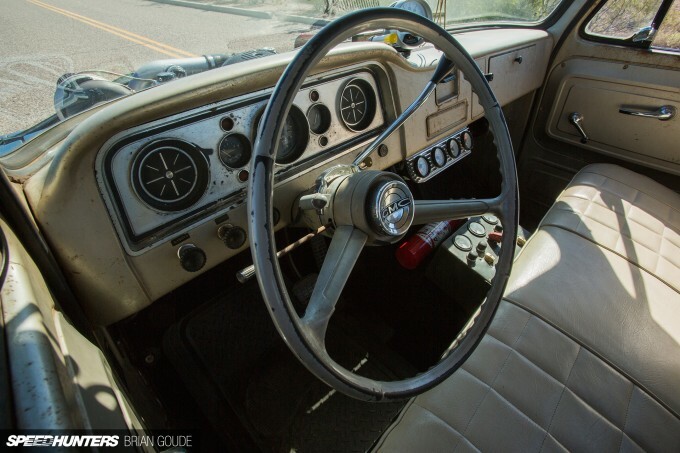 The C10 retains its factory interior along with the original weathered paint from 1964. The sun-baked blue hue, dings and imperfections on the outside simply add character in Loren’s eyes. 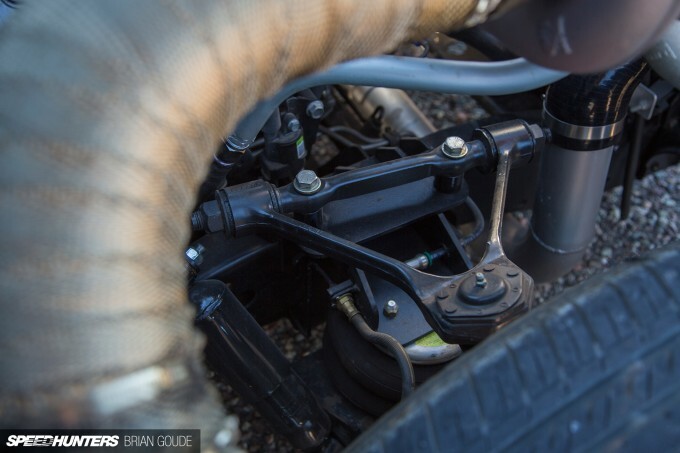 Grip is provided in the rear by 295/65-15 Hoosier DOT drag radials, which wrap around the American Racing Torque Thrust wheels. 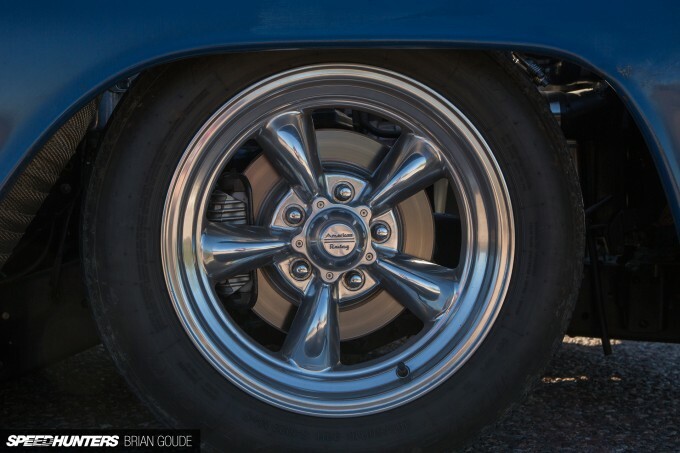 Up front are a pair of 215/60R16 tires that try their best to stay on the ground, and Corvette C5 disc brakes replace the original drums on all four corners. 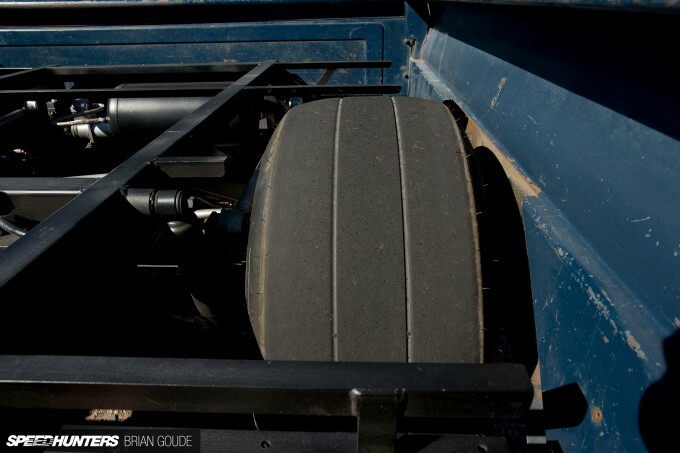 The truck runs a 4-link in the rear and a basic air suspension setup all around, but in this case the latter is only used to get the truck down Loren’s rocky dirt road of a driveway. Other than that he never touches the air bag switches. 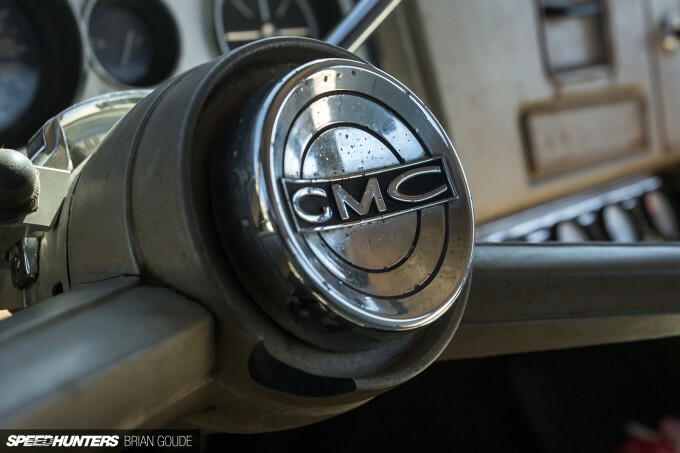 Like those stereotypical movie characters, this GMC is about as far away from a polished show pony as you can get, and again, like those classic bad guys, we wouldn’t have it any other way. 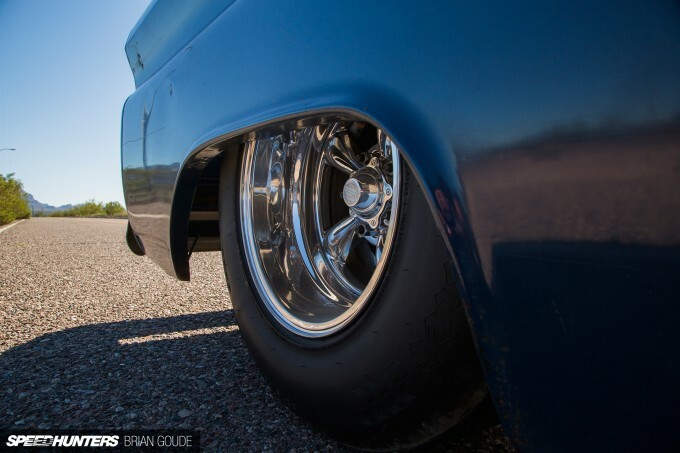 Make sure to press play above to see the C10 in motion. Out of control. Digging the video too! 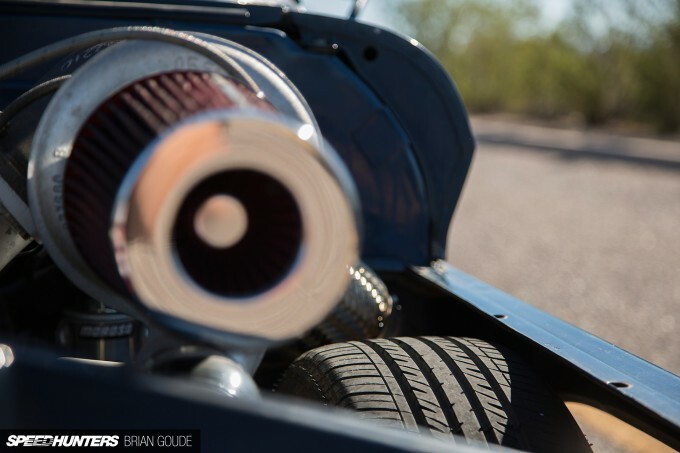 Why do hot rods seem so at home out in the desert? Is it because they're fundamentally on the fringe of society themselves? That head on shot is one of the sickest images I have seen on the internet in a long time. 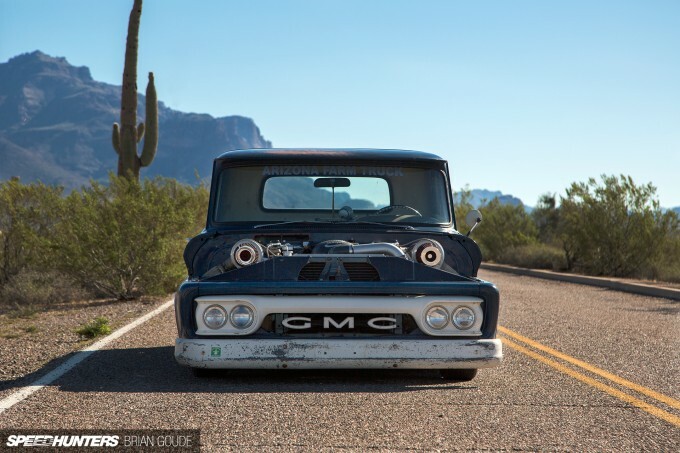 Sometimes the whole bonnet off thing irks me, but in this truck's case, it's perfect. A4999 Right? Apache Junction is a nasty place. aftermarket replacement) would have been a better choice. rad! The video was icing on the cake but it I kept anticipating the owner to haze some tires or at least give us some turbo sounds. Great work SH! @intmd8r depends on how you like your power. 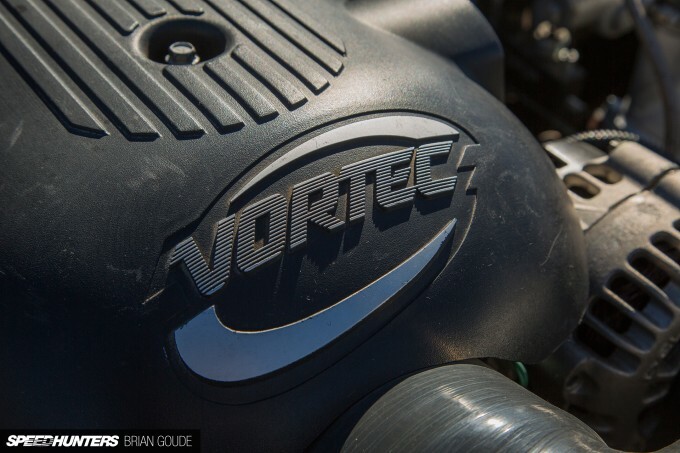 The Vortec intakes seem to perform well on boost, particularly in the midrange, and can be had dirt cheap. If you brought your wife a set of 40s, would have her showing them of or would you put a hood on it? The hood is off because otherwise it would overheat. SBC's get super hot when you add boost. 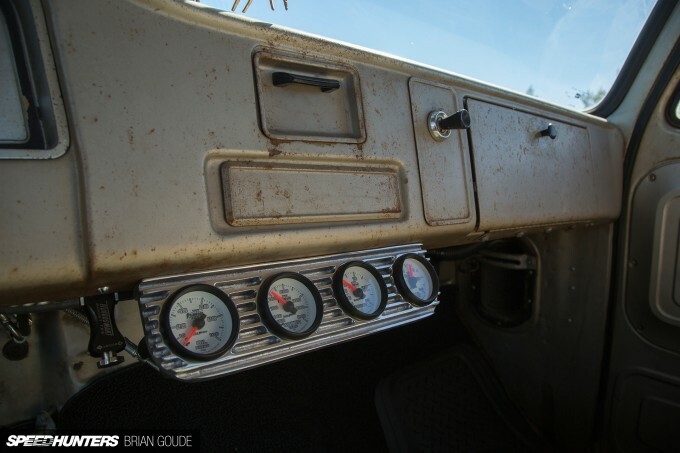 is there any fast 4X4 trucks in Apache Junction? I feel my 84 Dodge W100 is pretty fast.